DAUPHIN, Man. -- Students at a Manitoba high school have a major incentive to show up for class -- they could start their summer driving a truck. 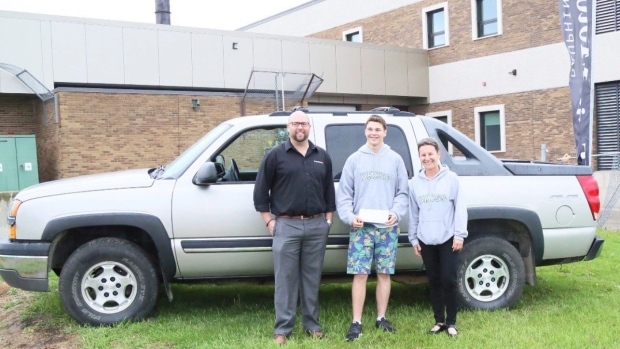 Kids with 90 per cent attendance at Dauphin Regional Comprehensive Secondary School are entered in a draw to win the vehicle at the end of the year. "Our motto is if you are here we can build relationships," teacher Patty Goodine said Wednesday. "The idea behind this is to help guide the students and help them become successful and graduate and to open doors to many options for their future." Goodine said there has been a 20 per cent increase in attendance since the program started. "Our main goal is to get students here so we can be a support to them," Goodine said. "And I think everybody recognizes, obviously our sponsors recognize, the importance of attendance because they are willing and eager to give." The incentive program started four years ago with monthly prizes. Students with a week of perfect attendance had their name entered in a draw to win iPads, GoPro cameras or gift certificates. A secretary at the school decided to raise the stakes. She donated a used BMW convertible as the grand prize at the end of that year. "The students were really excited about it. It is definitely a really good incentive," Goodine said. In the following years, local dealerships have donated a vehicle. Grade 10 student Zach Zurba took home a 2004 Chevy Avalanche truck on Friday. "It was amazing," Zurba said. He doesn't have his driver's licence quite yet but hopes to start taking the truck out in the next few months. He said students really look forward to the prize. "They go to school just because of the vehicle I think," he said. Five other students maintained perfect attendance -- one of them for the third year in a row -- and each received gift packages donated by the community and valued at more than $1,000. A Jeep Grand Cherokee has already been donated as the prize for next year. When students return to class in the fall, it will be parked near the front entrance of the school so "students know what they are working towards," Goodine said.